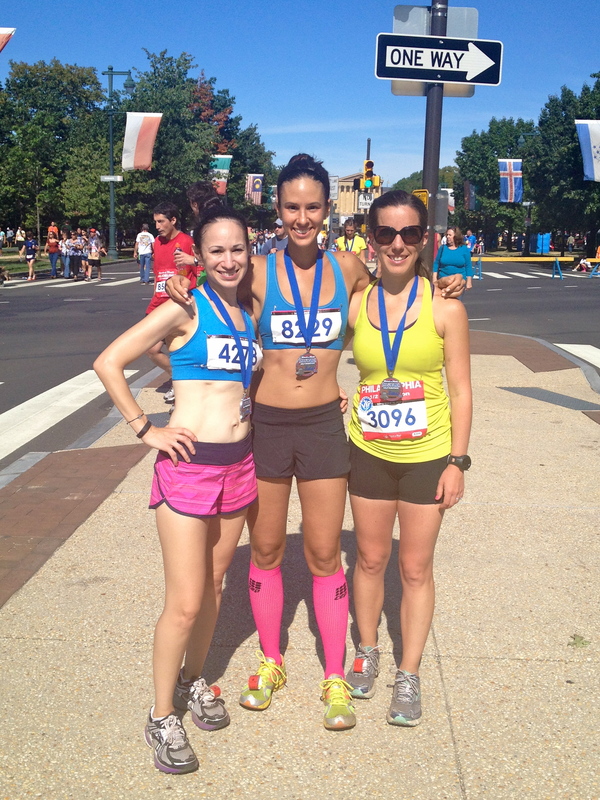 This past Sunday marked my third consecutive running of the Philadelphia Rock n Roll Half Marathon. And, I’m excited this year’s wound up being a PR (Personal Record) race for me! 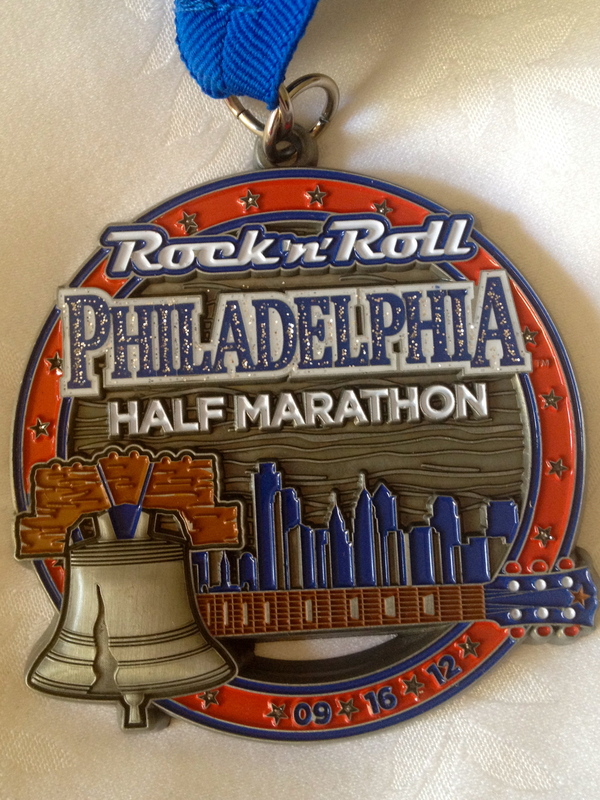 Philly RnR has a significant place in my running history. In 2010, it was the first half marathon I’d ever run. Thinking back, that race featured a spectacular crash and burn around mile 10. Fun memories. Despite that first experience, I keep returning as it’s a convenient race – both schedule and course-wise – as a fall marathon tuneup. I ran it as such last year, racing it comfortably. This year, I wanted to full-on RACE it as an assessment of marathon training progress thus far. According to Run Less Run Faster, a 1:45 half marathon is a good indicator of feasibly running a 3:40 marathon. 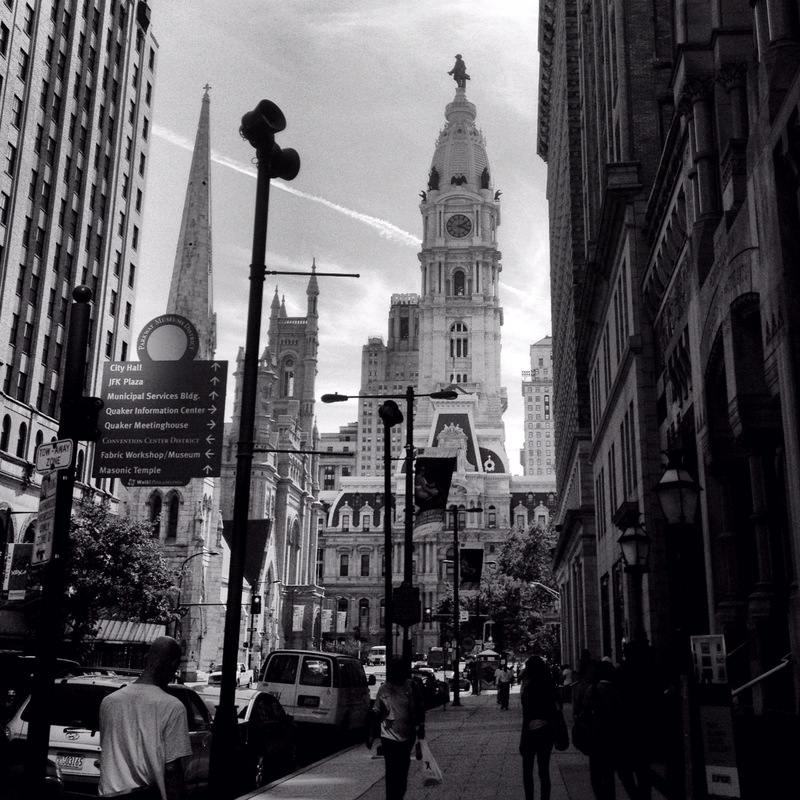 I decided to make the 1:45 push in Philly as a test. It’s early enough yet (a bit more than half way through training) to make any necessary training adjustments, post-race. 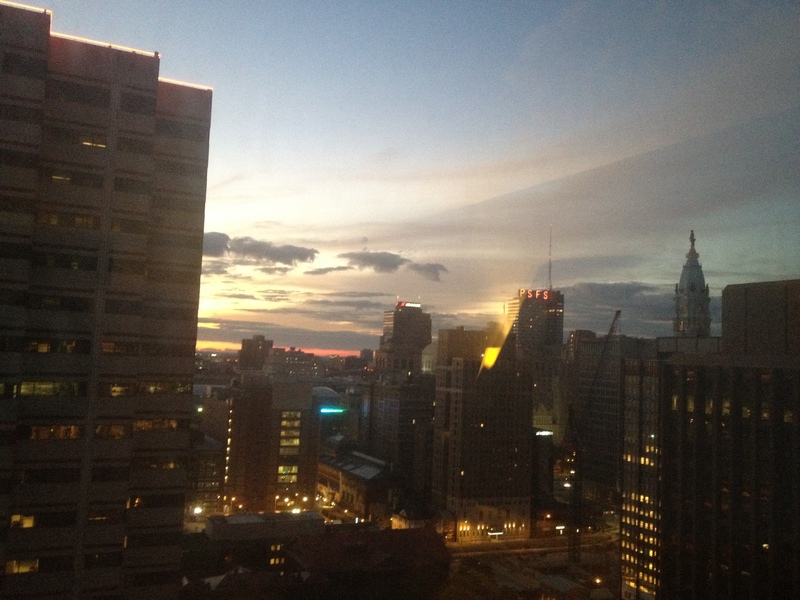 The lovely Erica and I arrived in Philly Friday afternoon to settle in and visit the expo early. 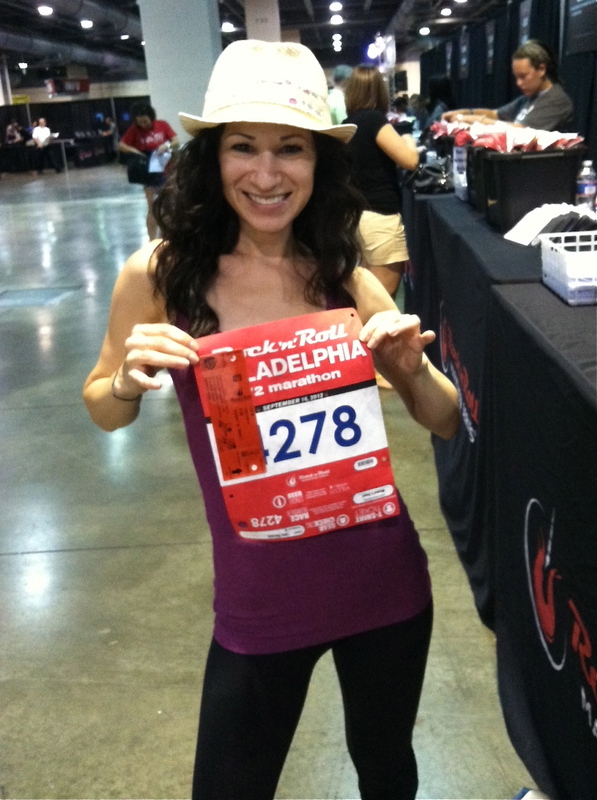 We did a quick sweep of vendors at the expo and left with race bibs in-hand. The rest of the day was spent walking around the city, which helped loosen up my legs. Friday and Saturday were relaxing. I had time to meet up with a childhood girlfriend for brunch. I did a little carb loading. I finally met Jess (Fit Chick in the City) in person! All good things. Sunday morning was forecast to be the coolest day of the weekend. Weather reports showed morning temperatures in the 50s and sunny. My plan was to race in only a sports bra and shorts to stay comfortable on the course. I brought a long sleeve throw-away shirt for before the race start. Didn’t even need it. It wound up feeling much warmer than expected. I lined up in my corral and waited. The race went smoothly. My plan was to conservatively aim for a 7:56 min/mi pace to hit my 1:45 time goal. Of course, I realized the reality meant I’d have to race at a slightly faster pace to account for any extra distance accumulated over the course. For some reason, I always seem to run an extra .15 – .30 miles over the race distance. This even after I took care to run tangents in the city portion of the course where there were a lot of turns. One of my main goals in this race was to practice pacing. I admit my tendency to run too fast in the beginning of a race. The wave start at Philly RnR is truly great. They do an excellent job of easing congestion on the course. However, it also means there’s a lot of running room from the very start – ideal conditions to speed off feeling great on fresh legs! I found myself getting caught up in some faster paces than I’d planned. Once I realized, I began keeping a closer eye on my own pace and let people around me pass by. (So hard to do!) I reined myself in and let my body settle into a nice, even effort. The first 4.5 miles within the city confines went quickly. I was careful to avoid any potholes and uneven pavement. I practiced taking water from the fluid stations (I’m weaning myself off my fuel belt). My only gripe would be the first few miles were head on into the sun. I didn’t bring my sunglasses, so any discomfort there was my own fault. As we turned back toward Eakins Oval, where the start line is, I was comfortably running around a 7:53 min/mi pace. My form felt spot-on. Perhaps race photos will confirm? My foot strike was light and my legs felt at ease. A few times I found myself assessing my form by inspecting my shadow as I ran. It’s actually quite amusing to do. The race course gets relatively quiet as you move out to Kelly Drive, along the Schuylkill River. It seems you don’t see many spectators from mile 5.5 until close to the finish line. Except for the few bands that line that part of the course, there aren’t a lot of distractions. Since I generally race without music, this was the stretch where I had a lot of time to think. I considered my racing effort and how it felt compared to my recent 20-mile long runs. I thought about how the effort of running double this distance (granted at a slightly slower pace) would feel in November. I expected to feel tired around mile 10 or 11, so I began to prepare myself to push through. I broke the course into segments to help with the mental aspect. I knew the early stage in the city would be easy. The next stretch, miles 5 through nearly 9, would be quiet and steady. It’s helpful knowing the turn back toward the finish line comes close to mile 9. That’s where I knew the mental coaching would begin. I told myself to hold steady until mile 11, and then begin pushing pace. I wanted to convince myself that holding onto my sub-8 min/mi pace would be easy enough I’d have energy to kick at the end. There were a few moments when that felt doubtful, but I was willing to stick to the plan. Funny enough, leap-frogging place with another runner helped me keep pace in the last few miles. We seemed to take turns passing each other. He looked like a relatively fast runner who was keeping an “easy” pace. So I decided to stick close to him on the course until the end. I saw him after the finish line and congratulated him on a good run. He said, “You were running fast so I decided to stick near you!” Guess that’s just what we runners do to get through the final miles. I was very happy to have reserved enough energy to kick in the final mile. I dropped my pace to 7:47 min/mile and ran the last (nearly) half a mile at 7:29 min/mile. Quite a surprise as when I ran the NYC Half in May at an 8 min/mi pace, I had no energy left at the end to speed up. 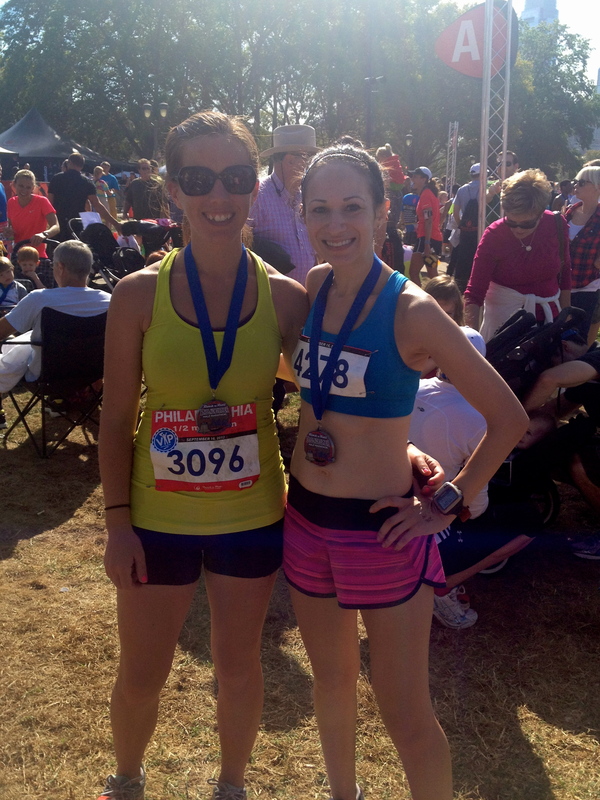 To end the Philly half that way was a big boost! This was both a distance PR and a course PR! So cheers to a new half marathon PR, and to running with good friends! Congrats Lora! Great race recap! Next year you’ll probably run in 1:30 🙂 So proud of you, lady! Ha! Well, first thing’s first: NYCM 2012! Thanks, Leticia! woohoo! congrats on the PR!!! so exciting! I’ve been looking forward to reading this! That IS some nice hardware. Rock N’ Roll comes to Denver this weekend! My husband is racing the 1/2. I know he’s pretty excited, been a few months since he has done a road race. Congrats on TWO awesome PR’s! Thanks for sharing the “over the years” improvement you’ve made at this race. First of all, IT’S INCREDIBLE. Second, it just goes to show everyone that hard work always pays off! You ladies look great, glad you had such a great race and a fun weekend! Thanks, Courtney! Came out of this one feeling good (maybe had more gas in the tank??)! Thanks for all the encouragement! Congrats on a great, race girl!!! A 2-minute PR is huge and it’s just amazing to look at your course history. Happy for ya! Loved this recap of the Philly RnR! It brought me right back to that morning (though you were a bit speedier than me). Congrats on a PR and an awesome time.